For several years now, the Theme Whips I’ve been building, the ‘Indy’ style bulls in particular, have been built with two plaited bellies much the same way as the Standard Bulls of Noreast Whips. The main difference between an Indy style bull (Young Indy, Raiders or Crystal Skull) & a Standard Bull is the weight. The Indy bulls are heavier, due to a longer core & extended bellies. They’re designed to be heavier, as that is a characteristic of that style whip. Recently, I’ve experimented with yet another core construction for use in some lower priced Indy style bullwhips, seeing excellent results with this core modification. These have been selling on both eBay & Amazon. This new core construction will not replace the core that’s used in the current Theme Whips, as well as the Standard Whips. Rather, it’s an option for a lower-priced Indy style bull, & one that may be used in other whip models on Noreast Whips. 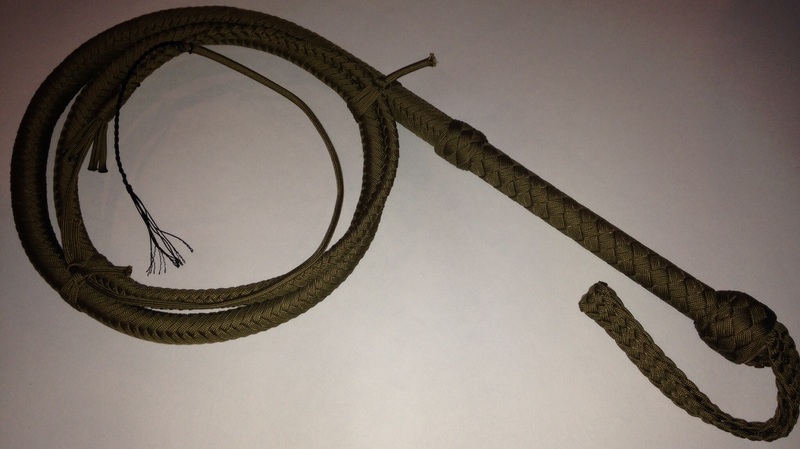 By using the new core with these ‘eBay & Amazon Indys’, less materials are needed in the whip’s overall construction, primarily the amount of nylon paracord that’s used. Less time is also required to build a whip with this method, so the price point drops. Make no mistake, this has proven to be a solid & proven construction method & I’m happy to offer these new whips to you! So, What Is This New Core? The new core consists of a length of sinker cord packed with 6 mm sized bbs attached to a 3/8 inch diameter steel rod. These are larger sized steel shot than what’s used in the Standard Whips (both Snakes & Bulls), as well as the Theme Whips & Baby Snake/Bull line of whips, which use 4.5 mm bbs. The larger size bb core, once layered & tapered, is covered with a 12 strand plaited belly. Once the belly is layered & bound, a 16 plait overlay is applied. When placed side by side with a 16 plait Standard Whip or Theme Whip, the differences are very hard to see. They appear virtually the same, yet feel much different. The new ‘6 mil’ cored Indy whips are a bit heavier than the Theme Whips I’ve been building for several years. This may be good for you Indy enthusiasts, or others who enjoy heavier whips. The ‘6 mil’ whips are solidly built, plaited as tight as Noreast Whips’ reputation & crack with ease. The page is not yet up on the Noreast Whips main site for the 6 mil cored Indys, but will be very soon. Keep an eye out for a Facebook post, Tweet, Google + notification or Noreast Whips newsletter email. If you’re not currently signed up for one of those social channels, then get crackin’! As always, if you have any questions about this post or would like to order a whip, contact me at noreastwhips@gmail.com. Talk again soon! This entry was posted in New Addition, Whips In General/Photos and tagged Amazon Indy, eBay Indy, Noreast Whips 6 mil core. Bookmark the permalink.